Our right angled range of audio cables are assembled with gold flashed connectors and available in black or white and in various lengths. 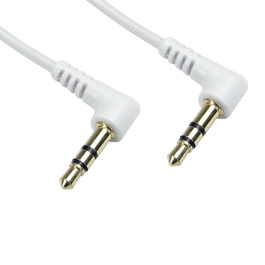 The right angle connector is easier to connect equipment where a straight connector may cause the cable to bend and risking damage to the cable. While they have strain relief, the right angle can also act as strain relief within itself.